Do you want to avoid the frustration of sharing screenshots and links? Yes, it’s not a dream anymore to be able to share your screen with your friends and co-workers in the middle of a video call. Squad is the new face of chatting app. It is earning surprised looks as it has come up with a technology where you can share your screen in the middle of a video call. Squad, whose CEO is Esther Crawford, launched its app last week. It has raised about $ 2.2 million, right at its debut . It is about to become much popular than any other chatting apps among the teenagers with its amazing technology. They can share the memes and laugh about them together, they can find something interesting and study it together and they can do more such stuff. Squad allows 6 people to join the video call at a time. However, it is not necessary to perform continuously. You can just bounce in and out of the video call as and when you feel like. You may just share your screen if you go away from the video chat instead of showing the person a blank screen. The chatting app like squad makes people feel less lonely. It doesn’t always need a person to be on the chatting app. You can go back to phoning even with the app on in the background. Squad can face tough competition from other chatting applications like Facebook messenger. They have other flawless features which when imbibed with the new screen sharing technology could give something more interesting and can be called as the next version. There are many other popular chat apps. Do you want to know how can we predict the bright future of chatting applications? 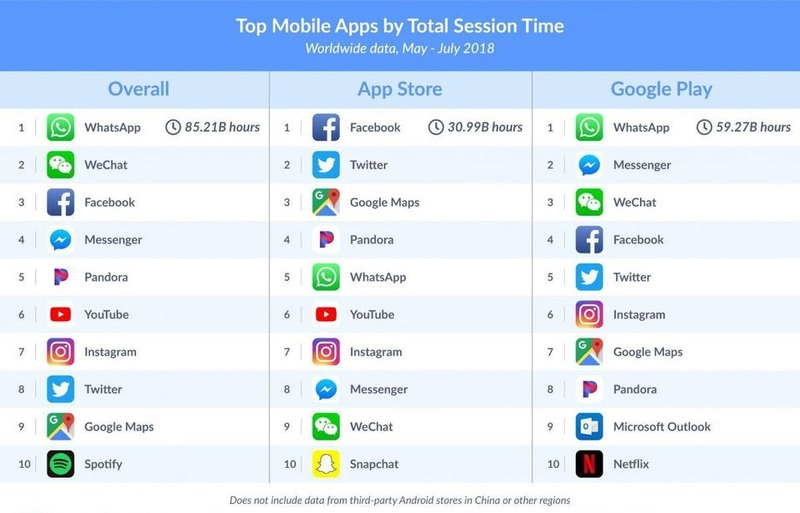 We have the statistics for 2018 that shows how much time people spend over chat apps either in searching for one in Google Play or in App Store. It also has a column showing overall time spent by the people in search of chat applications. If you want to create a chatting app like squad, you must consider building such app along with the already popular features of other chatting apps. These apps are need authentication for the user to start using them. A user needs to register with his mobile number or email ID in order to get himself registered. An OTP is then sent on the given phone number which should be entered to know if that number belongs to you. Once the identification is done, a user is ready to start. The customization makes a profile personalized. If you wish to create a chatting app you might consider providing your users with the happiness of choosing a nickname and a profile picture for their profiles. The user should be allowed to change the chat background and fonts as per their liking. Search is an important feature in any apps that you create. You need to make sure, the user is able to search his contacts and any chats based on a particular word. The user can also search for any media shared previously. File transmission is distinguished feature when you create your own chatting application. The feature allows a user to share various file formats on the chat application. The user can share images, documents, contacts, pdf files, audio files and other such files with their contacts at the tap of a button. The more the merrier. Group chats would allow friends or co-workers to share thoughts, ideas and connect at a platform where they can talk to each other. Group chats can be fun while you share memes and trash talk about things with your friends. While building your own chat app, having a video and voice call feature is an added advantage. People like staying connected. What could be more proper than calling or talking face to face on video calls? They give a feeling of closeness to people. Stories are best expressed using images. Allowing a user to share images in the form of stories is a new trend in the chatting apps. People share their stories as events in life and let others know about the latest news. This is the most useful feature in any chatting application. This feature can be helpful to track someone if they share their live location. Directly enabling adding a contact from the app on your phone will make it easier to get the contact in your phone list and will make things much more convenient. The mobile chats can be securely used over the web as web chats with a QR code which needs to be scanned through your mobile chatting apps. Along with all these features, you can add the latest screen sharing feature like the squad app when you Click here to Create your own chatting app to make it more fun. Wondering who would help you with the development of mobile app? At Coruscate, we provide free consultations to validate your ideas. Give us a call and we can help you capture the market with your newest chatting app! Want to make your own chatting app like Squad, WhatsApp or Facebook? Get a Free Quote Here! » How to Build a Chat App With Node.js and Socket.Io? » How To Build Your Own Group Chat App like Telegram And WhatsApp? » Why Choose Node.js To Develop Real-Time Chat Applications For Your Business?